John Wells’s phonetic blog: what the ell...? Our Deputy Musical Director is struggling to find the right words to express what he wants to say to the choir. When we sing the phrase we will sing, he wants us to pronounce the l-sound in will differently from the way we would speak it. And he demonstrates the way he wants us to pronounce will when we sing. It’s a good thing he does demonstrate it, because he doesn’t have the technical vocabulary to explain what he means. And if he had, the choir members probably wouldn’t have understood it. When speaking this phrase we use a dark l, or even a vocalized sound. But in singing it I want you to use a clear l.
I have to hand an excellent book entitled A Handbook of Diction for Singers, by David Adams (OUP, 2008). Excellent, that is, up to a point. The author is not a phonetician (and does not claim to be). Here is what he tells us about “the Italian /l/ sound”. Although he is American, and is targeting speakers of AmE, he is attempting to make the same point as our DMD. Let’s analyse this account. • “…with the tongue rather tense…” I know of no evidence that the two languages differ in the degree of lingual tension for l.
• “…making contact with the palate well behind the teeth…”. That is, English l is alveolar, while Italian l is dental. • “…with a collapsed pharynx…” I’m not sure what would be involved in the collapse of the pharynx, but I’m sure it doesn’t happen every time we utter English l. Narrowed or constricted pharynx, could be; but not collapsed. • “…the tongue must be forward…” Now we’re getting to it. Not only is the Italian sound dental, but the body of the tongue has a different configuration. • “…the vowel shape of the preceding vowel must be behind the tongue…” Sort of true. But how do you put a “vowel shape” “behind the tongue”, rather than somewhere else? Certainly the l of Italian crudele kɾuˈdeːle should have front, e-type resonance, rather than the backer vowel resonance of the l in AmE daily. But it would be wrong to suggest that the l in Italian nulla must have u-resonance. It’s ˈnulla, not ˈnuɫɫa. Likewise, the l in colpo is not o-coloured. • “…the sound must have resonance as well as forwardness.” But l always has resonance of some kind. The question is, of what kind? As Kenneth Pike documented in his ground-breaking Phonetics (1943), there is a sense in which the use of vague impressionistic terms, even if they are not well-founded in anatomical and physiological fact, does not matter, as long as the teacher also offers an ostensive definition by directly demonstrating the sound involved. He called these pseudo-facts “imitation labels”. How would I teach English-speaking students of phonetics to produce a clear l when required? I’d start by getting them to produce some kind of l involving contact of the tongue tip with the teeth or the alveolar ridge. Keeping the tongue tip in its place there, I’d point out that it is possible to arrange the remainder of the tongue in all sorts of different configurations, which correspond to all the various vowel sounds the students know how to make. I’d get them to produce an ɑ-coloured l, then an ə-coloured, an ɔ-coloured, an ɛ-coloured, an i-coloured, even perhaps an y-coloured or œ-coloured lateral. Try all the possibilities! Make it a game! We call the laterals with back-vowel resonance “dark”, those with front-vowel resonance “clear”. Then I’d get them to analyse what colour of l they use in various English words. Try let, look, allow, bullet, tell, field, full, all…. Are they all the same? If not, what determines the choice between them? Are the l-sounds different when we compare tell us and tell them? Then I’d demonstrate some Italian words and get them to imitate them and analyse them in the same way. Does the l in crudele have the same vowel coloration as the l in English daily? (For some British students, it might.) If not, what is the difference? How does Italian alto differ from English alto? How does the Italian pronunciation of coloratura differ from the English pronunciation of the same word? (Not just in the l-sound!) What about fatale faˈtaːle compared with English fatal ˈfeɪtɫ̩? Say molto ˈmolto, bella ˈbɛlla, scialbo ˈʃalbo, all with a clear l.
Maybe it wouldn’t work any better or worse than Adams’s approach. But at least I’d have the warm glow of believing I had taught my students something true rather than obfuscate the matter with nonsense. 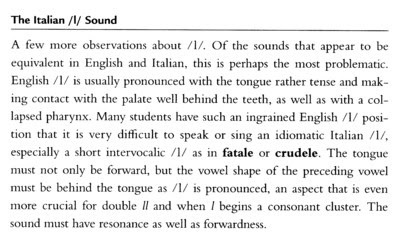 As an aside: kɾuˈdeːle for crudele or fa'ta:le for fatale seem to be based on the conception that there be vowel quantity in Italian. This conception seems plainly wrong to me, at least for as much as vowel quantity should mean the same thing as say in German or Czech or Swedish or Latvian---all languages that do undeniably have vowel quantity. I don't want to start a separate discussion on what is just an issue of tertiary importance here, but since I see this misconception often I feel I must not fail to voice my protest against it. It is also dangerous in a way (it renders ridiculous the speech of one who believes and practices it). There is vowel quantity in Italian, but only in Italian phonetics, and not in the phonology, i.e. not as in the languages that do undeniably have vowel quantity in the sense that it is functional. There is no being or having in phonology except being functional or having distinctive function, though of course there are other, paralinguistic types of function, and there was a long argument some time back about the extent to which Italian uses vowel quantity for emphasis or in intonation, but even then full vowel length admittedly sounds ridiculous. (I see Alex has referred to something which may be that discussion, but either he hasn't linkified it, or this iPad is being as impossible as usual.) It's incompetence in that use that renders ridiculous the speech of NNSs who believe and practise it. I'm halting this thread (Italian vowel length) here, and will delete any further attempted contributions to it (including your most recent ones, Wojciech, of which I have nevertheless taken a copy). We thrashed the issue out in 2010. Enough is enough. How sensible. Something useful about the new layout! But I wonder if the reply link is still working. By all means delete this if it is. Perhaps part of the problem is having to break automatic reflexes that tell you when to use [l] and when to use [ɫ]. For me and other Americans, [l] (dental or alveolar) is a foreign sound that just needs to be learned, like [a] or [y] or [ʈ] or [ʀ] (for me, [a] is the hardest of these). I'm a native Italian speaker, and I don't think I normally pronounce prevocalic /l/ as dental. It's usually apico-(post)alveolar for me. ... and as a native English speaker I'm quite confident that my postvocalic (i.e. dark) /l/ is frequently dental. I don't think that makes it sound any different though. Indeed, in Irish phonology velarized consonants are called “broad” (and palatalized consonants are called “slender”). I think one of the points that David Adams is trying to make (although he doesn't express it clearly) is that when the /l/ is correctly dentalized, it slightly colors the vowel that precedes it (as well as the vowel that follows.) This is difficult to observe in a single speaker or singer, but the effect is magnified when a group of 40 singers do it as uniformly as possible- the difference is quite impressive. I love reading through your blog and look forward.